My fellow food blogging friend at I Am Gourmand once again planned another lovely romantic dinner at an Italian restaurant in Taipei. If you are walking north on Fuxing N. Rd. (復興南路) from Daan MRT station (捷運大安站) the restaurant will be on the left-hand side of Fuxing. Be warned, there are two No. 352’s on Fuxing N. Rd. If you’re coming from the MRT station, it’s not the first one, it’s the second one after the clothing store. 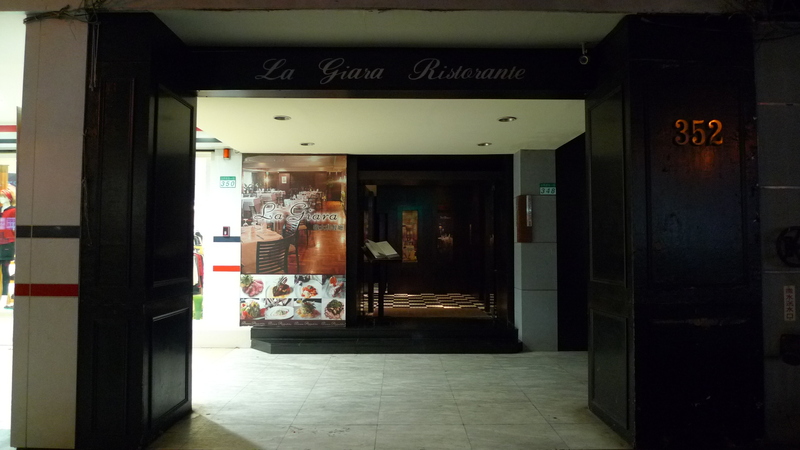 From the street, the entrance of La Giara looks the photo above. Walk into the lobby and follow the black and white checkered floor up the stairs. At the top of the stairs is the entrance to La Giara. 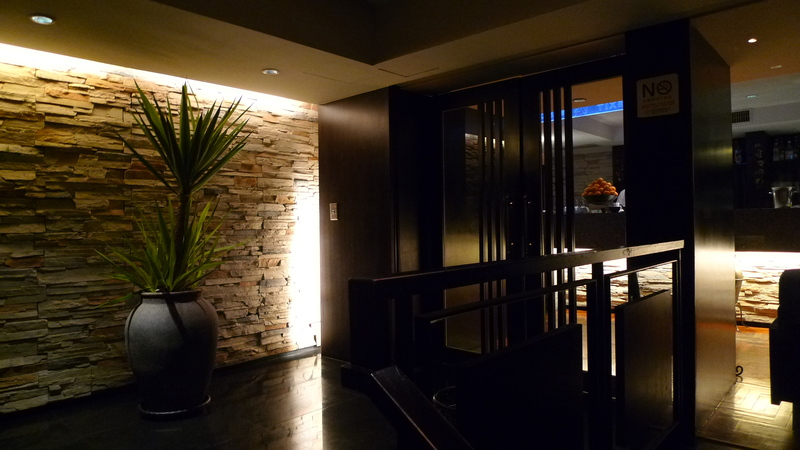 Make reservations before coming! The restaurant didn’t fill up while we were there, but I hear this place is popular, so better safe than sorry. 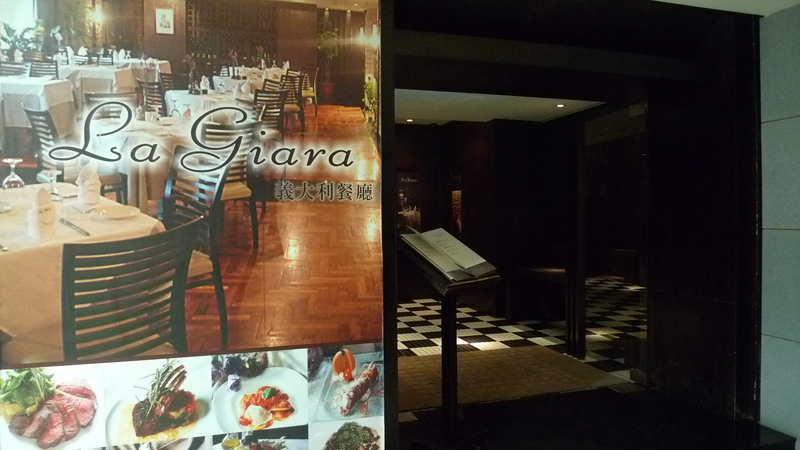 The inside of La Giara is a giant open space with rooms on both ends of the dining area. The lighting is pretty dim, the tables have fresh flowers, and there is soft Italian music playing in the background, which makes for a pretty romantic setting; I can see why everyone says this is a good date place. In researching what to order prior to coming I had read on several reviews that this is a popular spot for proposals. We didn’t happen to witness any, but I can see why it is. First thing to come out was the complimentary bread sticks. We all thought the bread was pretty tasty. 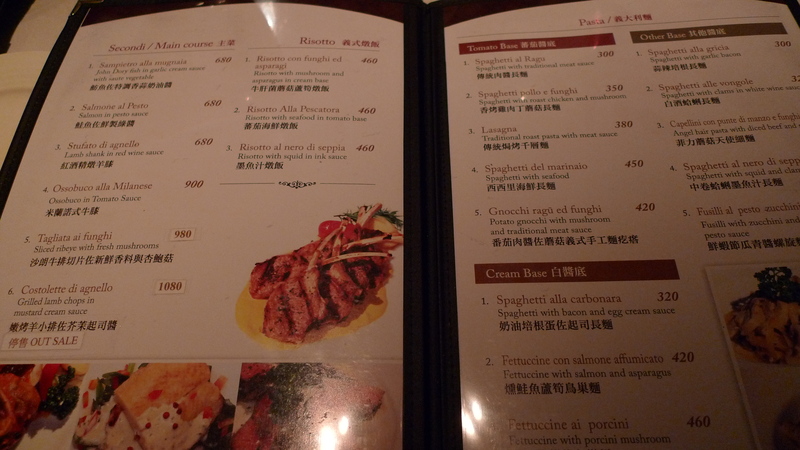 I think that of the Italian restaurants that I’ve been to thus far in Taipei, these were my favorite. 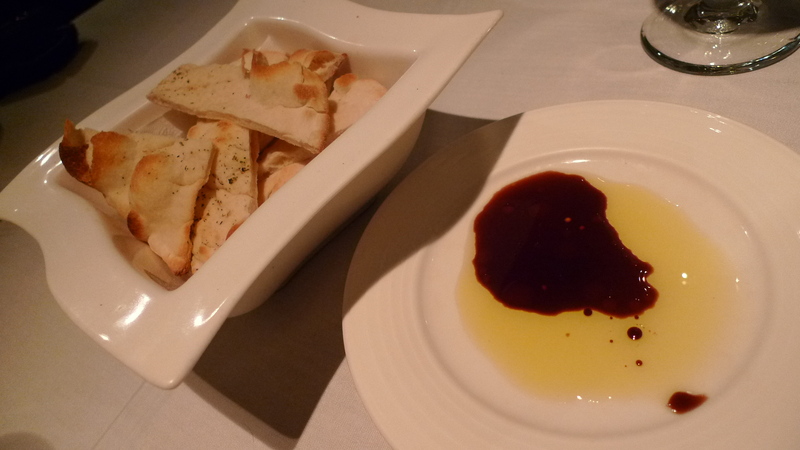 They had a herb, salt, seasoning sprinkled on top and the bread itself was fresh and hot. Note, the olive oil and vinegar bottle do not have spouts, even though they look like they do. The tops are actually caps, so don’t embarrass yourself like I did and pour before taking the top of: you’ll make a loud noise as the cap clanks onto the plate. 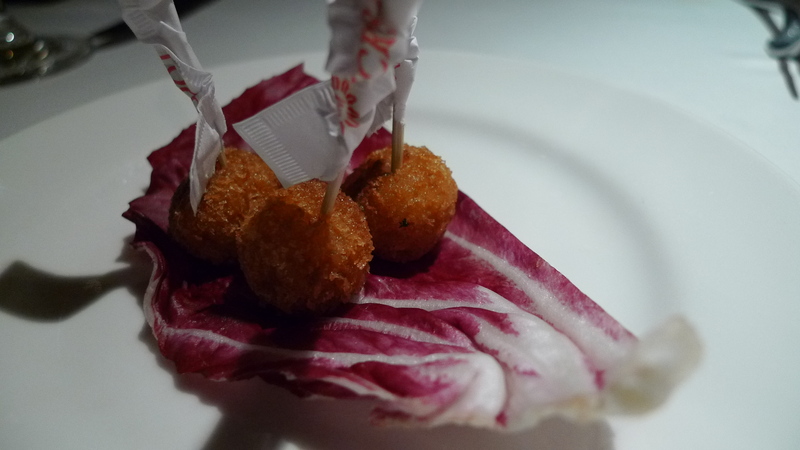 After the bread the server put a plate with three tiny fried balls pierced by toothpicks down in front of us. We noticed that no other tables got this, so we were a little confused, but decided to go with it. I mean, who doesn’t like a complementary amuse. First impression, it tasted like a delicious tater tot. This ball was tiny, like the size of your thumb nail tiny, but it tasted pretty good. We asked the server later what it actually was and found out that it was actually rice and beef. Tasty, although, they could have taken the wrapper all the way off the toothpick… We later learned that the chef thought it was one of our birthdays, hence the amuse. So the nice thing about this place is that they will split everything on the menu for you onto different plates to make it easier to share. 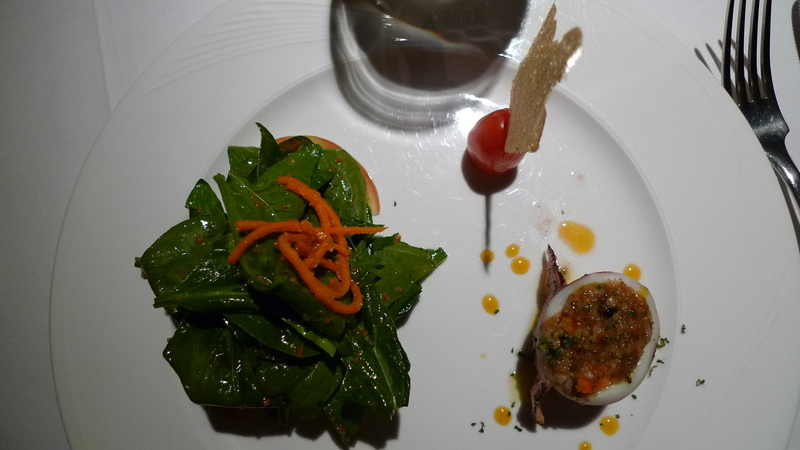 We decided to get the stuffed squid topped with breadcrumb, served with salmoriglio olive oil dressing, lemon juice, garlic, oregano and parsley (西西里式香料麵包丁透抽捲/Calamari alla trapanese, serviti con salmoriglio) for 490NT and fresh spinach leaves tossed in a dressing of olive oil, rice vinegar, garlic and ginger (菠菜沙拉/Insalata di spinaci) for 380NT. The server said that the salad was big enough to split between 2-3 people, so had the chef split the salad onto three plates for us. We didn’t know that they were going to slit the squid too, but he did. The salad was a hit with all three of us. The dressing was delicious: light and well balanced. Also, for the price, I think it’s a pretty decent size. The stuffed squid was ordered based on reviews both Estella and I had seen online. First, for the price, the serving seemed small. The server said it was because the chef split it into three portions to split equally so it just looked smaller. Anyways, we were all underwhelmed by the stuffed squid, which was sad because we all really wanted to like it; I mean, it looked delicious. The stuffing lacked something that was as simple as salt. There was a sauce drizzled around the squid: you have to get some of the lemon sauce on each bite. The lemon sauce adds some much needed acidity to the dish, but even so, we were all still kind of let down. 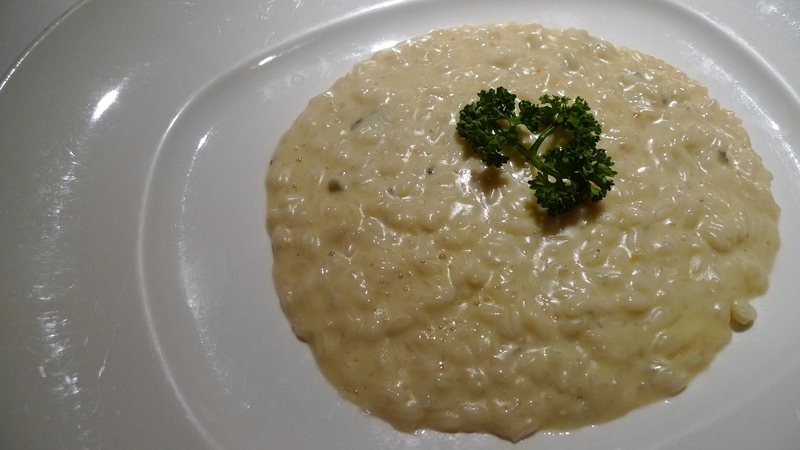 I love risotto and I love cheese, so I got the risotto in four kind cheese sauce (起司燉飯/Risotto quatro for maggi) for 530NT. I was originally thinking about getting the seafood risotto, but since Andrea was getting that, I figured I’d go with the cheese risotto. When it was put down in front of me Estella said, now that’s a real risotto. It looked delicious on the plate, spreading on the plate like I learned a risotto should from watching a lot of Top Chef. The rice was a delicious al dente and the sauce was cheesy. Like, super cheesy. I’m not sure what four cheese were in this sauce, but I can tell you that bleu cheese was most definitely one of them. This risotto was rich. Really rich, and honestly not for those who 1) don’t like cheese 2) don’t like strong flavors. Even I could only finish half of it. With that said, I still really liked this. The rice was cooked well and the sauce was cheesy, rich, and creamy. But, if you’re looking for something subtle, something light, don’t get this. 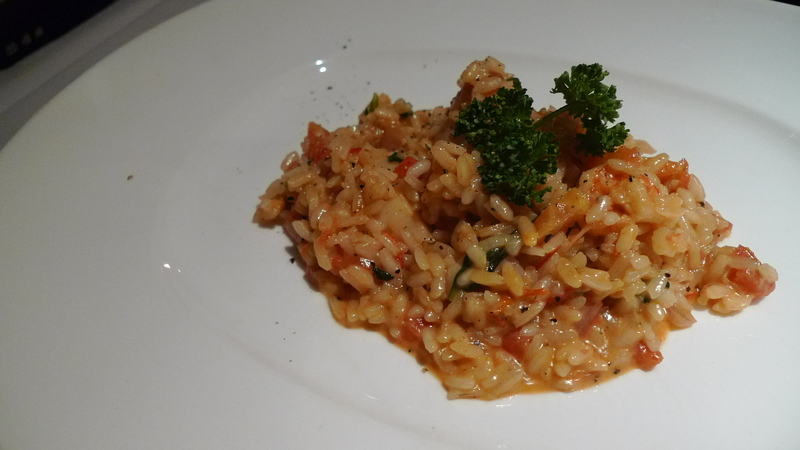 Andrea ordered the risotto with shrimps and scallops (螯蝦干貝海味燉飯/Risotto gamberi e cappesante) for 530NT. This was really good. Again, the rice was a nice al dente and the tomato sauced was pretty good. I think I actually liked the sauce better at Luna D’Italia, but either way, this was tasty and Andrea really liked it. 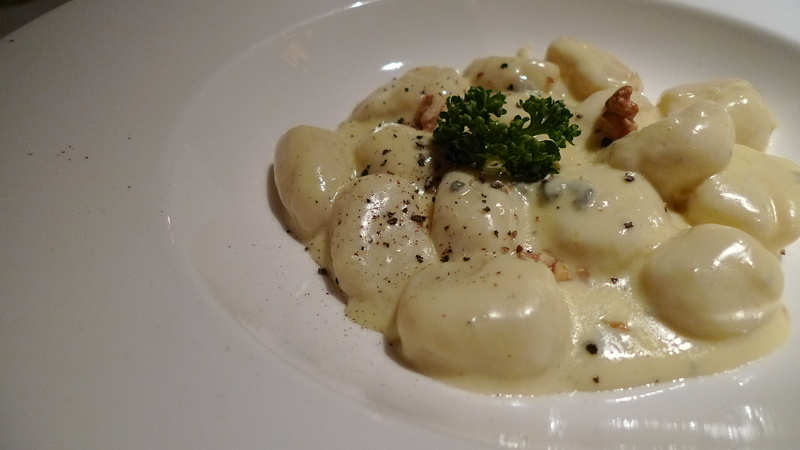 By far the biggest hit of the night were the potato dumplings with gorgonzola cheese (藍乳酪馬鈴薯麵糰/Gnocchi di patate al gorgonzola) aka potato gnocchi for 530NT. Estella loves gnocchi, as do I, and the gnocchi at La Giara definitely hits the spot. Light, fluffy, creamy, and amazingly delicious. They were like little potato clouds of creamy tastiness. By far the best gnocchi in Taipei, and the best gnocchi I’ve ever had (not that I’m an gnocchi guru or anything). The sauce was also tasty, light, and creamy. I would definitely go back to La Giara just to order this. For dessert, we decided to split the semi-frozen almond cake with chocolate (巧克力杏仁霜/Semifreddo di mandorle con cioccolata) for 270NT. We had originally wanted to order the homemade semifreddo pistachios (melting ice cream) (大廚特製開心果霜淇淋) for 300NT under the Chef’s Specials, but they were out. 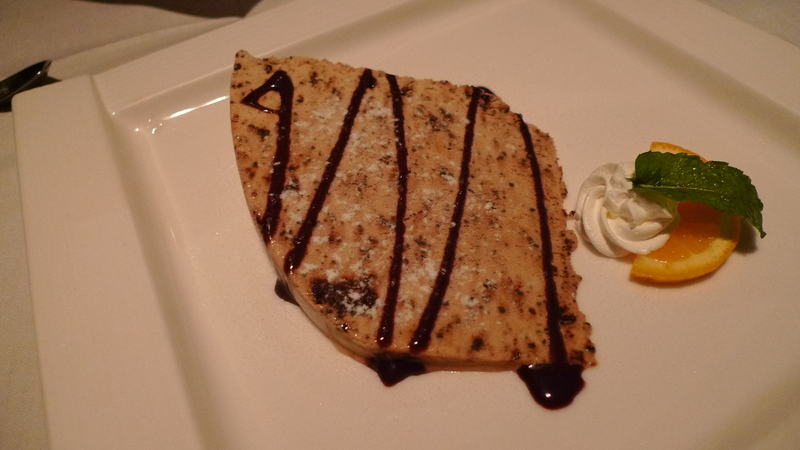 The semifreddo we ended up with, though, was delicious! Creamy, not too sweet, and nice and nutty. Compared to the one at Luna D’Italia, I liked this one better. I just thought the overall flavor and texture was better. Note that water here is not free, but they tell you that upon being seated. They have two options, sparkling water and mineral water. You pay by the bottle, which comes out to 140NT per bottle. Service here is pretty good, although, we had issues trying to get the attention of servers every once in a while. Overall, the food was pretty good. The portions are kind of small for the price, but the quality was good. Quality over quantity, right? 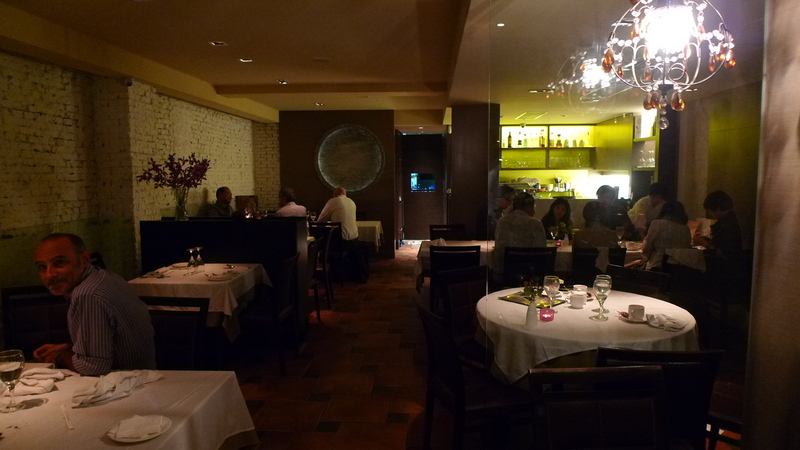 The chef/owner is frequently on the floor and in and out of the kitchen, which I had read about in other reviews. It’s almost like he’s a little ADD needing to constantly move around and/or check to see how people are reacting to the food. It’s a little distracting, but other then that I’d definitely come back for some of dishes here, ie the gnocchi, and maybe leave some others out, ie the stuffed squid. For a grand total of 3157NT – about 1000NT per person – we were able to get appetizers, a main course, and a dessert, and all left feeling pretty full and satisfied. 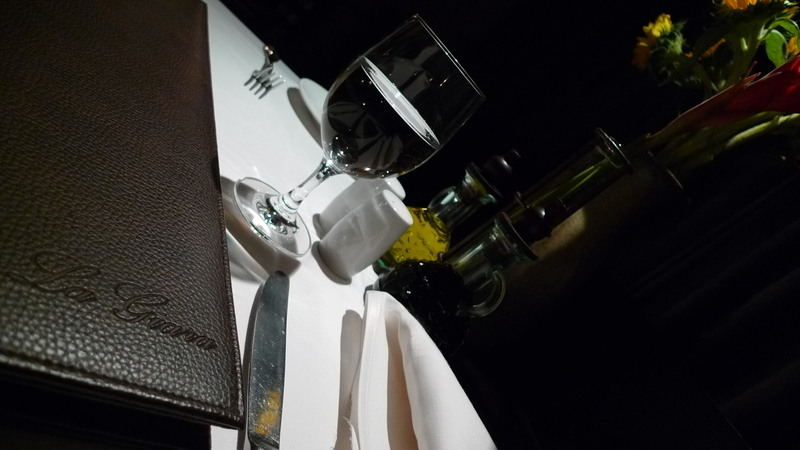 I noticed that they do have set dinner meals for either 1800NT or 2500NT, which was out of my price range. You can also just order a la carte if you wanted, which would probably run you around 600NT or so. Regardless, it was nice to find out you could still get a tasty three course meal at a reasonable rate. Good job, La Giara. My food blogging friend Estella planned another lovely dinner at Luna D’Italia, another delicious authentic Italian restaurant in Taipei. The nearest MRT station is Liuzhangli (六張黎), but it might just be easier to take a bus to somewhere around Dunhua S. Rd. (敦化南路) and Heping E. Rd. (和平東路). 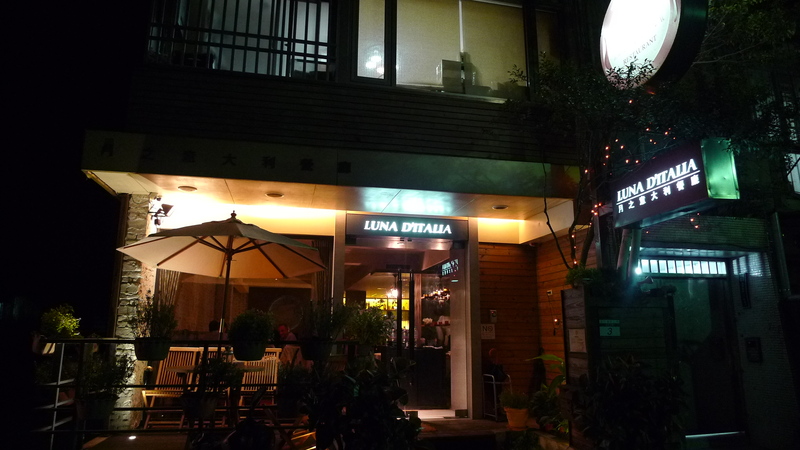 Luna D’Italia is in the lane in front of the Shangrila Hotel Mall on Dunhua S. Rd. with the Starbucks at the corner. I was told that reservations at Luna D’Italia are a must. Estella made reservations for 2 at 19:30 on a Tuesday night. The restaurant was full all night. First thing that came out was the bread. 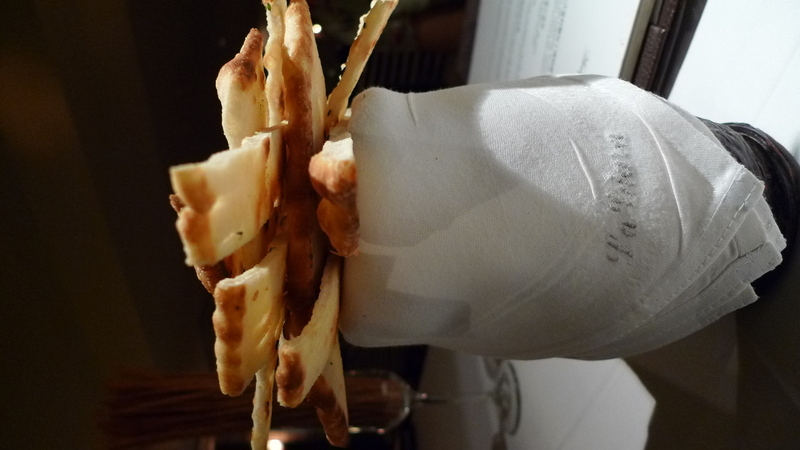 The flat pita-like bread was pretty tasty. It had some roasted herbs sprinkled on top that added some flavor. Eat it while it’s warm or else it gets hard. 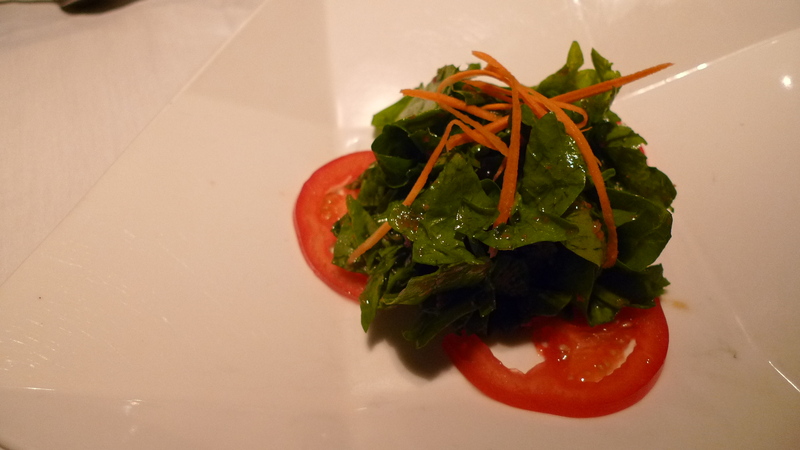 The salad of the day happened to be the Insalata di spinaci (菠菜沙拉/Spinach salad). I was originally debating between salad and soup (which was cream of broccoli), but I decided to go with salad – actually all three of us ended up with the salad. The salad was good. I thought the dressing was tasty and light: some kind of vinaigrette. 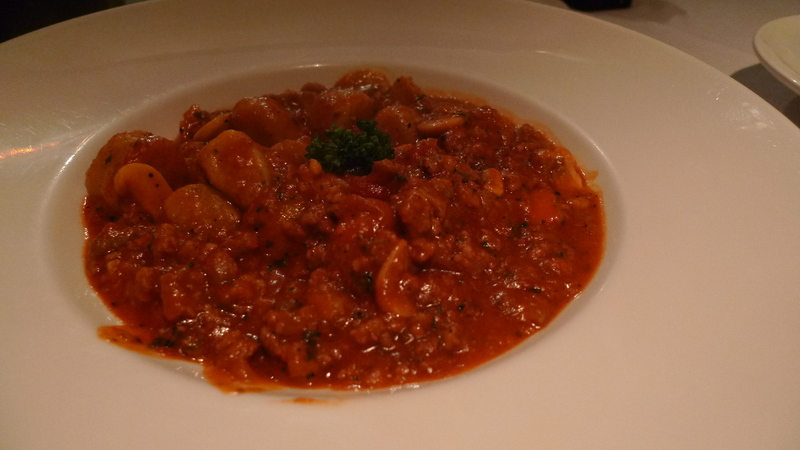 Estella chose the Gnocchi ragu ed funghi (番茄肉醬佐蘑菇義式手工麵疙瘩/Potato gnocchi with mushroom and traditional meat sauce) for 420NT. According to research I had done on the restaurant prior to dinner, patrons said that Luna D’Italia was known for it gnocchi and risotto. Both Estella and I found the gnocchi to be less than stellar: they just weren’t as light and fluffy as I like my gnocchi. In fact they were maybe even a little dense; however, the meat sauce was delicious. The meat, the tomato sauce, the mushrooms made for a hearty robust sauce. 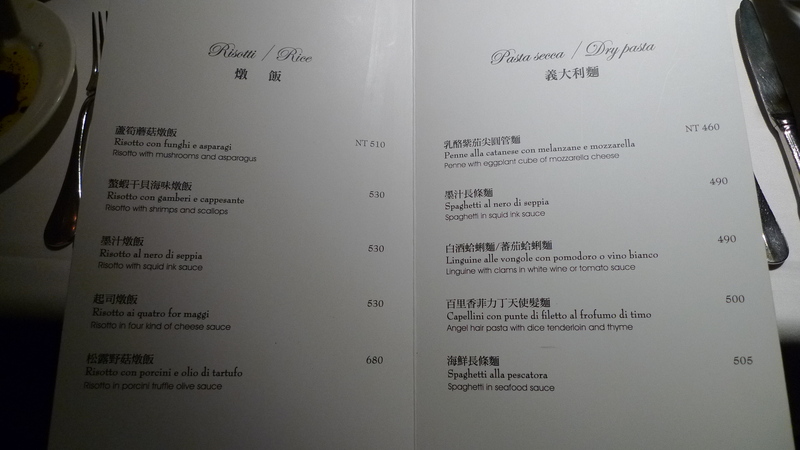 Wesley went with the Lasagna (傳統焗烤千層麵/Traditional roast pasta with meat sauce) for 380NT. I thought this was pretty tasty, as did Wesley. Compared to the Lasagna at Papa Gio’ I think they had different strengths. 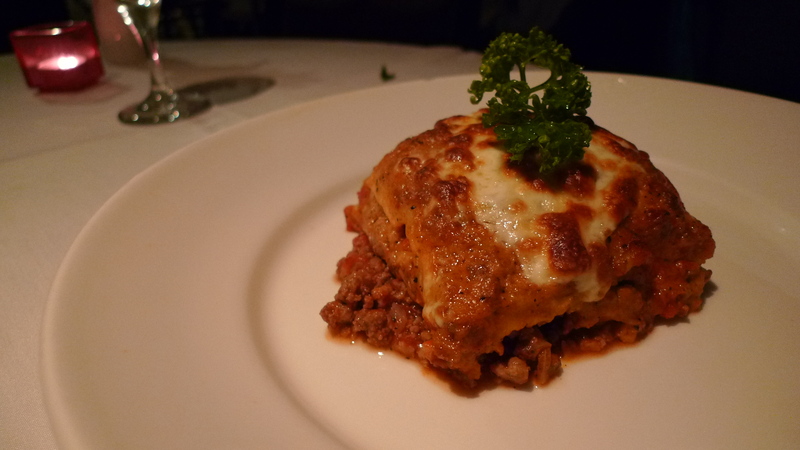 I liked the actual lasagna better at Papa Gio’ as I found the lasagna in this one to be over cooked. On the other hand, I liked the filling at Luna D’Italia better. It is just juicier and more flavorful in my opinion. 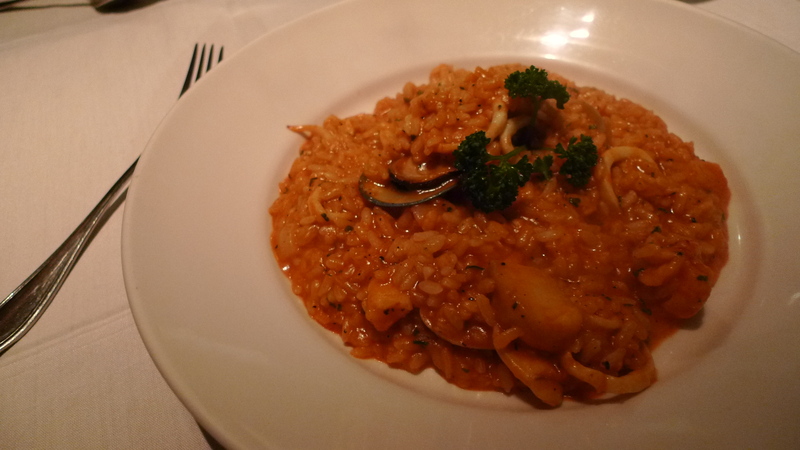 I opted for the Risotto alla pescatora (番茄海鮮燉飯/Risotto with seafood in tomato base) for 460NT. I love risotto and was very happy with this dish. The rice was a nice al dente and the sauce had a lovely tomato seafood flavor. There was also a hint of spice to this dish, which was a wonderful surprise since I love spicy food. Seafood-wise there was some sort of white fish, calamari, clams, and a muscle: all were delicious! 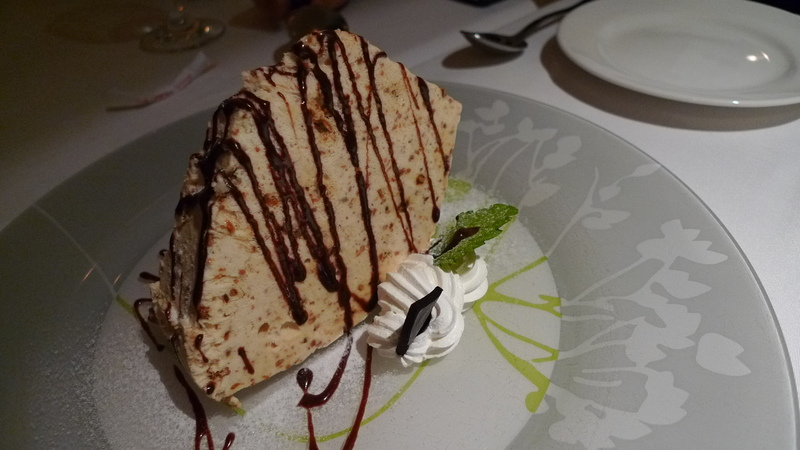 I had read that for dessert the Semifreddo di mandorle con cioccolata (杏仁霜派/Semi-frozen almond cake) was a must. Estella and I both ordered the semifreddo and it was delicious! I had never had a semifreddo before and I feel like I have been missing out. This wasn’t that sweet, but it had a great almond mocha taste to it. 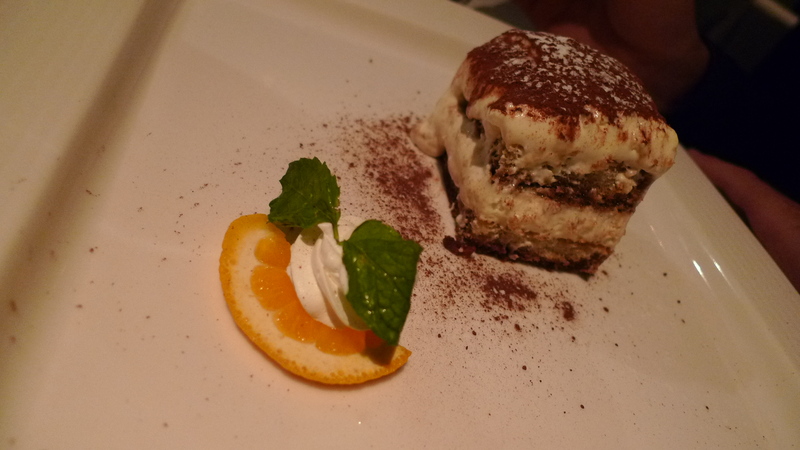 Wesley is allergic to nuts so he opted for the Tiramisu (提拉米蘇/Classic tiramisu). It was delicious! I didn’t really taste the mascarpone, but other then that I felt like everything was really well balanced. I’ve had some tiramisu that tasted way too alcoholic and others that tasted way too sweet. This was a good balance of everything. At the end of our meal they brought out our coffees and teas. Nothing special. The most annoying thing at this restaurant is that they serve Evian water THAT THEY CHARGE YOU FOR. When we got our check we were like, what are these 35NT charges? We asked a waiter and she was like, oh, it’s for the water. Now, I find it interesting that it’s not mentioned to you that they are going to charge you for water that they pour for you upon sitting down. I thought that was kind of annoying and a little dishonest on behalf of the restaurant. 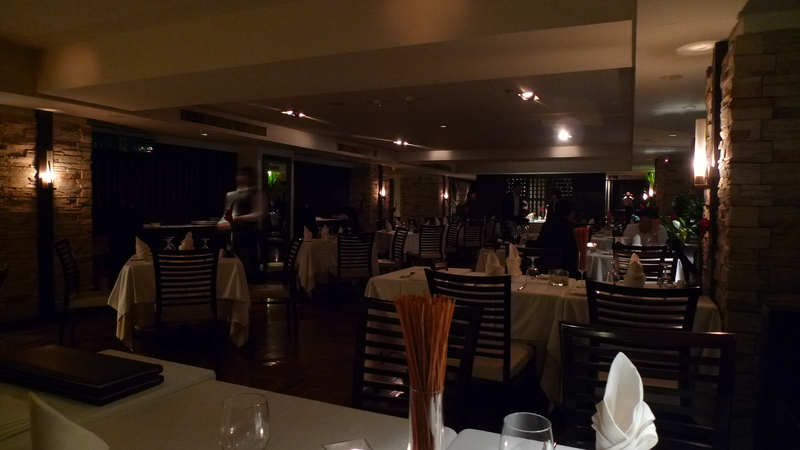 Other then that the service was good and the ambiance nice. They let us sit at our table after we were done and kept refilling our waters. We had joked before seeing our check that Wesley had drank an entire bottle of the water himself, and once we found out we had to pay for it he was like, well then I’m going to get my monies worth. It sounded like the servers spoke some English for those who do not speak Chinese. Overall, I thought this place was pretty tasty and worth the price you pay. I’d come back. They had some pretty tasty looking pizzas and another risotto that sounded good.